On Jan.16 my husband and I flew to Boston for the opening of my retrospective at the Griffin Museum of Photography. 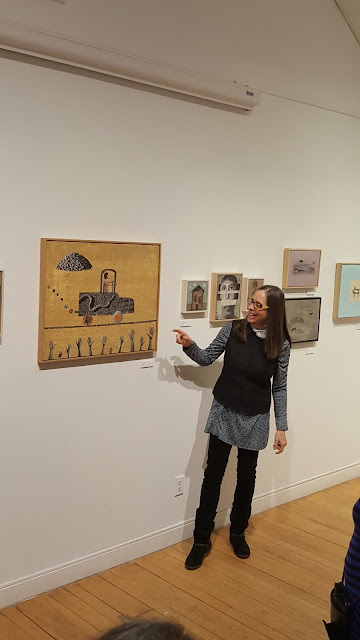 I don't think that Paula Tognarelli(the director of the museum)and I ever exactly planned it as a retrospective, but then, all of a sudden, there it was: 33 years of my work, stretching from 1984 to 2017. It turns out Paula and I are on the same wave length, twins from different mothers. She choose tough images, but also found and underscored the darkly funny ones, like "Sperm and Ovum" and "Snake Truck"(seen above). She ended up selecting over 60 images, filling the beautiful space beautifully, grouping the work following a rough time table of 1984-2003, 2005-2014, and 2015-2017. I was there on the opening night to give a walk through to a full gallery, probably 45-50 people. I went through the gallery selecting images that were especially important or timely for me to talk about, and discussed as well my techniques and processes. People asked questions so that I could fill in what I do, what I think about, and what I react to when I work. It was a truly wonderful evening for me, seeing all my children, lined up on the wall, patiently waiting to be appreciated. I felt proud, a little overwhelmed, and extremely grateful. There are people like Paula Tognarelli in the art world, but they are few and far between. She is one of those unique people who love art and artists and have the means and the where-with-all to support us on the rough and tumble journey that we have chosen to take as creative people. It was a night like no other for me, and I can only give thanks to the art gods(and Paula)for having made it happen. Congratulations Holly, on a perfect evening and a wonderful show. Nicely said -- what a wonderful experience for you and all who were lucky enough to join you that night and who will see the show. Beautifully expressed. I will try my best to get to the show at the Griffin. I've always admired your work, Holly. Thank you!